When the Samsung Galaxy S7 and S7 Edge were announced last month, I’d only had a short amount of time to get my hands-on the device, but having now spent three days using it as my daily driver, it’s time to take a look at the best and worst of the handset. There’s a more detailed full review to check out too, of course, but these are my favorite – and least favorite – bits of the phone after three days. The phone is just as good looking as the first Edge – more so, in fact, as you can now get a black model Galaxy S smartphone again, which hasn’t been the case for a while. The additional curve added to the rear panel also helps the phone feel more comfortable in your hands. The Edge panels are useful for the first time. Yes previous models used them but they weren’t particularly useful – now you can quickly flick through a whole load of different information without having to jump through other menus. I still don’t use them all the time – you really need to get into the habit of actually realizing it’s useful – but I have at least used them this time out. The always-on display is handier than I thought. While I could see the theoretical benefit of the always-on display, I doubted how much use it would really be. I was wrong. Sure, virtually every screen around me has a clock on it and I wear an S2 Classic most days, but it still came in handy. Make of that what you will. The camera is much improved. Lots of phones can take respectable, if not glorious photos in bright sunlight, but most smartphones suffer in more dull or outright dark conditions. From early testing with the S7 Edge, this shouldn’t be too much of a problem. I also like the live effects preview and quick controls for adjusting the strength of the effect before you even take a shot. MicroSD cards return! This might seem like a small one, but I don’t necessarily want to spend an inordinate amount of time deleting photos or apps simply to be able to continue to use my phone. And nor do I want to store my entire life in the cloud necessarily. Samsung now supports moving apps to a microSD card to free up space, in addition to photos, although it does it in a non-standard way. Quick charge lets you go from zero to max in less than two hours – but only when using the included cable/charger. Waterproofing brings peace of mind. For me, the idea of going swimming with my phone isn’t one that really appeals – and nor should it if you’re planning on buying an S7 or S7 Edge, both are IP68 rated, but they’re not designed for prolonged use at any sort of depth. What it does mean, however, is that you don’t need to worry if drop it in the sink when you’re doing the dishes, or you can take it in the shower if you just can’t pull yourself away from the latest episode of Serial. The fingerprint sensor actually works. Don’t underestimate how frustrating a sometimes-functioning fingerprint sensor can be. Needing to attempt it four or five times sort of renders the convenience of it useless. Luckily, this isn’t the case for the S7 Edge and I find it more reliable buried in the home button where it is, rather than on the back such as on a Huawei or HTC, or on the side like on the Nextbit Robin. It doesn’t use USB Type C. This might feel counter-intuitive, but I’m pretty happy that the S7 doesn’t use the new standard connector, because in reality it hasn’t yet established itself as the standard. What this means is that when you forget your cable, you’re screwed. No one will have one in your office, most likely. The situation will be better when Type C is more commonplace, but for now there’s not a lot of difference between proprietary and standardized. It’s beautiful – and sort of slippery to hold. The front is curved, the screen goes all the way round and the back also now has an additional curve. It makes it more comfortable, but no less drop prone. In reality, if you’re handing over your cold, hard cash for this phone you’ll probably want to put it in a case to protect it, which sort of ruins that beautiful design. The battery life was oddly short on my first day. The 3,600mAh pack powers a beefy phone and does a fine job, but on the first day it really felt like it was coming up short. Admittedly, I was setting the phone up, downloading apps, updating everything etc. – so it was a highly demanding day for the battery. Since then, it’s seemed a little better on battery life. By around 6PM, I’m down to around 50 percent with average use – not light use, but no video streaming either. You probably won’t get a full two days out of it if you’re a demanding user but that might not be a problem for you – and the quick charging really helps in this regard. The battery definitely didn’t make the same impression of longevity that the Mate 8’s did though. I’ll continue to keep an eye on this one. There might be a few software issues still waiting to be worked out. While performance has been zippy and almost faultless so far, the ‘almost’ part of that sentence refers to one occassion where it froze for 30 seconds to a minute, and then just rebooted with no warning. Often, software updates roll out to fix this sort of niggling issue, but it defintely stopped and made me go, ‘Hmm’. The screen is still a fingerprint magnet, but perhaps that’s just the price of beauty. 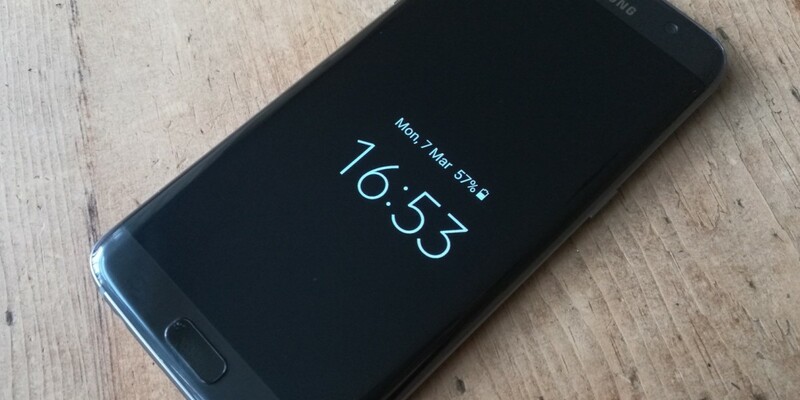 There are lots of reasons to like the Samsung Galaxy S7 and a decreasing number to dislike the family of handsets – if Samsung can take this sort of approach to the rest of its devices, it should continue to see commercial success. However, whether these small problems will be quickly ironed out, or whether they’ll grow to be real annoyances still remains to be seen.